The Maxibright Parabolic Reflector is a wide angle umbrella shaped reflector that delivers all of your light towards your plant canopy extremely well. The reflector is finished in a high white gloss powder coating and the lamp holder is fitted in a vertical position for a wide angle spread of light. 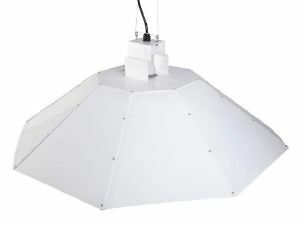 The design of this reflector spreads the light over a large area, so it is best suited alone inside a grow tent or a small room with reflective walls. If you intend to use several lights in your grow room this reflector will work very well, covering all of your plants below with an even spread of light. The Maxibright Parabolic Reflector is supplied flat packed, it is fully wired with a five metre cable to connect to your ballast and it just requires some quick assembling.